As part of the research for my PhD which accompanied the writing of my novel The String Games, I came across the work of Judith Kegan Gardiner who discusses female identity and writing by women. She suggests that where women write about female protagonists there is a special link and proposes the analogy ‘the hero is her author’s daughter’. When I first read this, the idea that I could regard Nim (my protagonist) as my daughter caused concern. While I recognised that other women writers may regard their female protagonists in this way, I resisted the idea of applying the analogy to my own situation. I was afraid that if I thought of Nim as my daughter, a natural progression would be to conclude that Jenny (Nim’s mother) represented me. This I did not want to think about. The character of Jenny is by no means an idealised mother: she is short-tempered, snappy, stressed, clumsy, resentful and all manner of other negatives. Her redeeming quality, however, is that she genuinely wants to try to be a good mother. The more I thought about the possible link between my protagonist and me, the more I came to realise that I was not her fictional mother – Jenny takes that role in the story – but I was her author-mother. This realisation enabled me to approach later drafts of the novel with deeper understanding of my characters and my role as an author in “mothering” my young female protagonist. It also brought into play the idea of separation–individuation, the process that girls and mothers go through in order that children can go onto to become unique, independent adults. I came to understand that by the end of my work on the novel, I needed to separate from the character of Nim I had created, so that she, as my protagonist-daughter could continue her life in a fictional context through the minds of my readers and I, as the author-mother, am free to go on and create other characters in new fictional writing. As this is a special post to mark Mother’s Day in the UK, 31 March 2019, I wonder, how do other women writers feel about their female protagonists? Do the theories of Judith Kegan Gardiner chime with you? I’d love to know what you think – please leave your thoughts in the comments. I entered a travel writing competition in 2016 and as runner-up, I was offered a bursary to attend a fiction retreat at Moniack Mhor, Scotland’s creative writing centre. One of the tutors on the programme was Elizabeth Reeder who writes novels, essays and stories. Her debut novel, Ramshackle, was shortlisted for the Saltire Literary Award in 2013 and she’s gone on to write further novels. The narrator of Ramshackle is fifteen-year-old Roe who one wintery day finds the man she thinks of as her father has gone missing. In the week that follows, Roe finds out more about herself and her father. At this point in growing up, Roe is an expert of her own experience but anything beyond causes anxiety. Roe’s voice is a mixture of confidence and vulnerability and this is something I wanted to explore in The String Games. Advice from Elizabeth was invaluable in moving forward with the middle part of my novel. Gail Aldwin’s The String Games debuts her talent in an intimate portrayal of family, love and loss, and one that gives a glimpse into how crisis might shape each of us. Elizabeth teaches creative writing at the University of Glasgow. I was fortunate to catch up with her at the Edinburgh International Book Festival in 2017 where she facilitated a wonderful readers’ workshop. Keep an eye out for other events Elizabeth is involved with. If you’re able to attend one of her workshops, seminars or talks you’re bound to enjoy it. The String Games will be published in May 2019 but if you can’t wait until then you could always dip into my short fiction collection Paisley Shirt. It is also available from Waterstones in Dorchester and Bridport, The Bookshop in Bridport, Gullivers in Wimborne and Serendip in Lyme Regis. 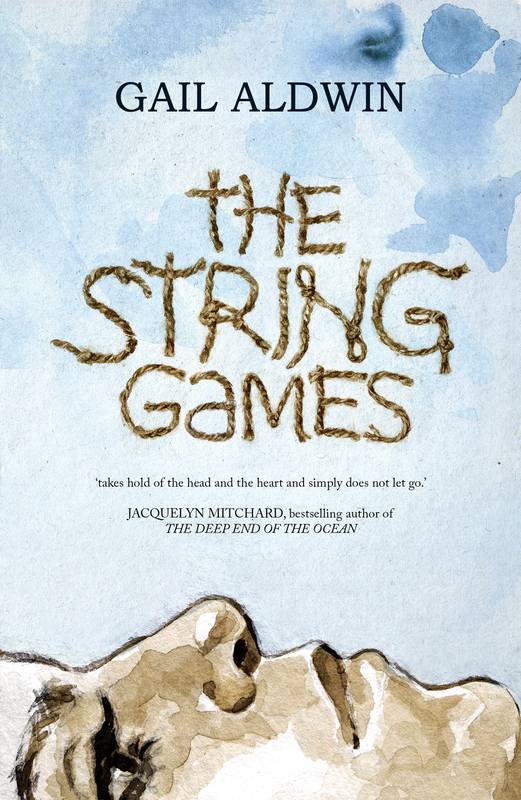 My novel The String Games will be published by Victorina Press in May 2019. It is a psychological drama that focuses on the legacy of loss for the protagonist when her four-year-old brother is abducted and murdered during a family holiday in France. The cover is being designed by Fiona Zechmeister and it is exciting to be part of the process from initial ideas to the final product. One of my roles has been to secure endorsements for the novel to support with marketing and promoting the book. From a study of novels which use child characters and child protagonists, I drew up a list of authors to approach. For my blogs each week this December, I will focus on the authors who have kindly offered their support. Nina Killham came back to me quickly with a positive response to my request. Nina is the author of three novels including Believe Me which is a wonderful book with a thirteen-year-old narrator called Nic. It is a funny and moving story about a boy who challenges his mother, an astrophysicist and atheist, by turning to the Bible for ways to understand contemporary life. I was first in touch with Nina a few years ago when she offer to give feedback on the first three chapters of a novel and the synopsis as a donation to the Authors for Refugees charity auction. I was lucky to win the lot and benefitted greatly from Nina’s feedback. We stayed in touch and she recommended several further novels for me to read so that I could learn how published authors develop stories around child characters. It was at Nina’s suggestion that I read Out Stealing Horses by Per Petterson. This is a great book that considers the lifelong repercussions from the accidental death of a child. Gail Aldwin excels at creating characters you care about. The String Games, her story of a child lost on a holiday to France, avoids melodrama and leaves the reader hoping the best for her characters as they move beyond the last page. I’d like to thank Nina for her support, encouragement and of course, that lovely endorsement. If you can’t wait until May to read my novel, you could always dip into my short fiction collection Paisley Shirt which is available from Waterstones in Dorchester and Bridport, The Bookshop in Bridport, Gullivers in Wimborne and Serendip in Lyme Regis. When Nicole Fitton and I met on Twitter we were keen to share the experience of living and writing in the South West of England. I am pleased to welcome Nicole to The Writer is a Lonely Hunter where she answers our shared questions (mine appear after). First, let me introduce Nicole. Nicole Fitton lives and writes in the heart of Devon. She writes both thrillers and short stories, many of which have been short and longlisted. This year her flash fiction piece ‘Yellow‘ was featured as part of National Flash Fiction Day on the Flash Flood Journal Blog. Have you always lived in South West England? The short answer is no! I started my journey towards living in the West Country as a ‘grockle’ (tourist). The children were small back then and we would set off at the crack of sparrows and head west. Like many who’d travelled before us, we would wind our way slowly down the A303 for two glorious weeks in North Devon come rain or shine! We promised ourselves that if we ever got the opportunity to relocate we would grab it with both hands. Well, that’s what happened. In 2010 we relocated because of my husband’s work. It was a big decision. I am so proud of the way our kids adapted. It was a big shock initially, but within a few months they were taking everything in their stride – even school lessons delivered on the beach – now that was a first! Until our move to Devon I had lived mainly in big cities such as London and New York. My work in international PR and marketing took me all over the world, and I know I draw on a lot of those experiences when I write. I now live betwixt the villages of Iddesleigh and North Tawton. Iddesleigh is famously the home of author Michael Morpurgo whilst North Tawton was home to the late poet laureate Ted Hughes. It is a place of isolation, and I love it. There is something quite profound about my small hamlet which runs along the river Taw. Perhaps it is the ebb and flow of the river. I’m not sure, but I know it has worked its way into my bones. Living in a farming community the effects of late harvests, early harvests, failed crops, all subconsciously inform my thinking. I seem to draw on the landscape especially with my short stories. Is there one particular place in the South West that is special to you, if so why? I find myself drawn back to the River Taw time and time again. When we first arrived in Devon, it was the first place I discovered within walking distance of the house. We would spend many a happy hour skimming stones, swimming or sitting on ‘the beach’ (a patch of sandy shingle by the river’s edge). There are many ‘hidden’ parts of the river and every time I walk there I find something new. Further afield I would say it would have to be the North Devon coastline. It is wild and structurally stunning. The rock formations you see are dramatic and magnificent. I have a story in mind for that coastline! Peppered in between the ancient stone cliffs are sandy coves and big expanses of golden beaches. My favourite beach is Westward Ho! The only place in the UK to have an exclamation mark as part of its name – fact! What is it like to be a writer in the South West? Devon is a superb place to write, and if someone were to do an audit or something clever like that I believe they would find a writer present in every village! There are a wealth of literary festivals and events across the county, which provide fantastic opportunities for support and collaboration year round.It is such a positive community. I belong to a group called the Sakura Positive Press Writers Group; we hold open mic evenings in our local pub for storytelling. It’s great fun. It would be great if we could roll this out across the region. Stories were initially told that way, and it would be great to see this form reignited. Dorchester in Dorset became my home in 2007. At the beginning, I wasn’t particularly pleased to be moving from my lovely life in south London but my children and me had to up sticks when my husband got a job in the county town. I soon came to appreciate the benefits of living in a county area and it certainly extended the childhood experiences of my son. He spent his summers building camps and swimming in the river where his London friends thought a good day out was visiting Chessington World of Adventures. Although I was brought up in London, I spent several years travelling overseas and have lived and worked in Australia, Papua New Guinea and Santiago de Compostela in northern Spain. I do like a remote and beautiful location but living in one is not always easy. There are stories set in Australia and Papua New Guinea in Paisley Shirt, my recently published collection of short fiction. Something of a place remains with me from all the different locations I’ve experienced. My husband is from Cornwall and we spent many summers on the north coast when my children were little. Our favourite beach is Chapel Porth near St Agnes where a river meets the sea. Out of season, my husband and son spent many hours damming the river in order to flood the beach but that wouldn’t make them popular in the summer when it gets packed with visitors. My novel The String Games draws from my experience of losing my son when he was three years old on a crowded beach. While I was busy smothering my daughter in sunscreen, he wandered off. I started searching for him by heading in the wrong direction. In spite of a tannoy announcement, he was lost for forty minutes then I eventually found him way down the beach jumping over the ways and completely oblivious to the panic he had caused. Closer to home in Dorchester, it’s possible to walk across the water meadows and experience Thomas Hardy country. I love going to the cottage that is the place of his birth in Higher Bockhampton. I usually take a detour to visit the great writer’s gravestone in the churchyard at Stinsford. Although it was Hardy’s dying wish to be buried there with his parents, the executor of his will had other ideas and Hardy’s body ended up in Poets’ Corner at Westminster Abbey while his heart was buried in Dorset. Along the shaded riverside walk I imagine how this place sparked ideas for Hardy and try to generate a few myself! What’s it like to be a writer in the South West? Dorset has a thriving writing community with literary events scheduled across the county. I am Chair of the Dorset Writers’ Network and work with the steering group to inspire writers and connect creative communities. We do this by putting on workshops and talks to support writers at different stages of their writing journey. The South West is full of creative people and I love to link up with writers in different counties. I have taken steps to achieve this by joining activities in Devon. I delivered a spoken word performance at the Sandford Y Festival book event and participated in the Chudleigh Dragons pitching competition as part of their annual festival. I would love to see better links for writers across the South West so that we can celebrate the creativity of the region. I was invited by Carol McGrath (you can find out about Carol and her first novel The Handfasted Wife here), to do a spoken word performance at the Sandford Y Festival. This took place on Saturday 7 July at The Lamb Inn in the pretty Devon village of Sandford. This award-winning gastro pub has a delightful function room where I shared my stories. Other activities included a meet the writers event where Carol McGrath, Jenny Barden and Jennifer Ash offered input on life as historical novelists. The day was rounded off with a balloon debate where the three novelists dressed up as their characters in a thoroughly entertaining finale. Very many thanks to Susie Williams for organising this event. I’m in the author spotlight on Jaffareadstoo today. Instead of focusing on Paisley Shirt, I share tips and strategies for writing and working collaboratively. Click here to pop over and have a read. I’m in good company today, staying in with Linda Hill. Here I share the inspiration behind the title story of Paisley Shirt and find out what Linda, a prolific book blogger, thinks about the collection. Why not pop over and take a look? 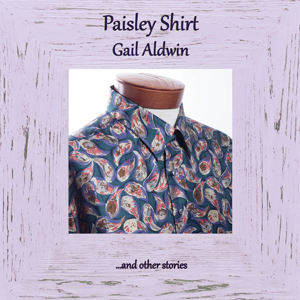 Paisley Shirt is now in stock at the Book Depository with free delivery. I am delighted to be on Maria Donovan‘s blog today sharing my strategies and techniques for writing flash fiction. Maria is an experienced writer of short fiction with two collections to her name: Pumping up Napoleon and Tea for Mr Dead. I was absolutely delighted when Maria agreed to endorse Paisley Shirt by describing my flash fiction as ‘sensitive, surprising, unnerving, tender and crucial’. Maria’s debut novel The Chicken Soup Murder has recently been published. It is narrated by eleven-year-old Michael who shares his experiences of family, community, loss and integration in a story which involves a suspected murder. It’s a beautifully crafted novel and well worth reading. Do pop over to Maria’s blog to find out more about how I approach the writing of short fiction. I had a splendid time at the Writers’ Day in Salisbury. The programme was packed and started with a warm-up session using improvisation as a tool for writing by Alison Jean Lester. The ‘yes, and…’ task was a great way to generate and overcome problems in story telling by working in partnership to produce alternating lines of a story. Further workshops followed including an excellent session delivered by Rupert Wallis which provided a rule of thumb for generating a 25-word summary. Rupert suggested starting the summary with the word ‘when’ and introducing the problem to be overcome with the word ‘must’. For my novel The String Games, a summary might be: when Nim’s brother is abducted and murdered as a child, she must overcome unresolved grief as an adult to integrate the loss. Susanna Dunn offered a workshop on ‘finding your voice’ which suggested that close attention to detail brings authenticity to writing. She advises writers to ‘listen with the ear of your heart’. Helen Corner-Bryant followed with suggestions for ‘unleashing your inner editor’ where she described ways to approach ‘instinctive’ and ‘structural’ editing. After lunch there were two panels: one with a focus on publishing and the next with advice from agents. The last session was offered by Mark Dawson which gave remarkable insights into the world of a hybrid author (one that has been traditionally published and self-published). Interestingly, he felt it was vanity to seek a traditional route to publishing when the options for self-publishing can be more lucrative and offer better engagement with readers.